What’s the biggest big-ticket item you’ve bought? For most of us, that will probably be our house, which we generally don’t have the ability to pay upfront anyway. Therefore, getting a good home loan is essential. I’ve recently been on the lookout for affordable home loans where my regular repayments will ideally be as low as possible. 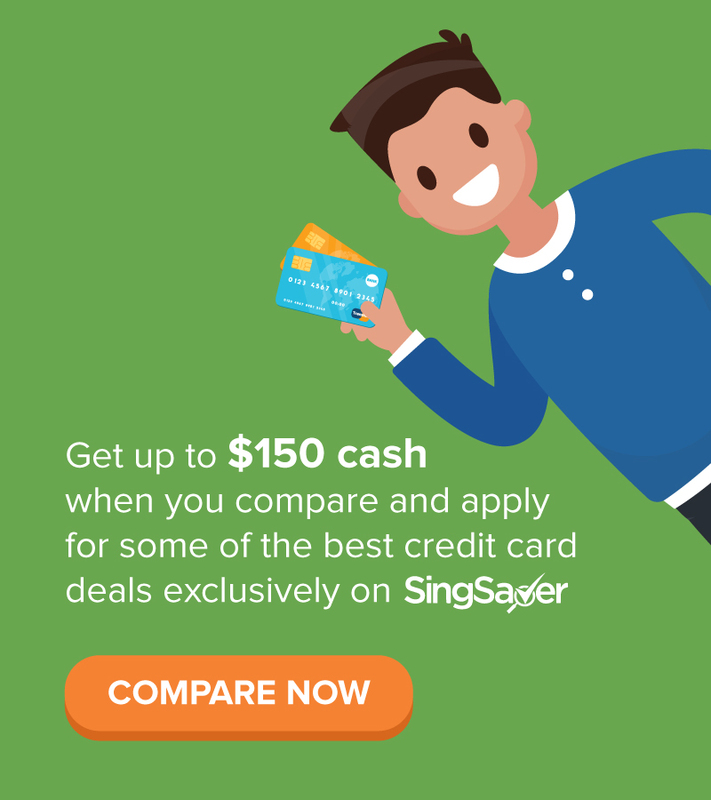 Most Singaporeans opt for a floating rate package, typically pegged to the SIBOR, which have generally offered better value than the fixed rate packages. 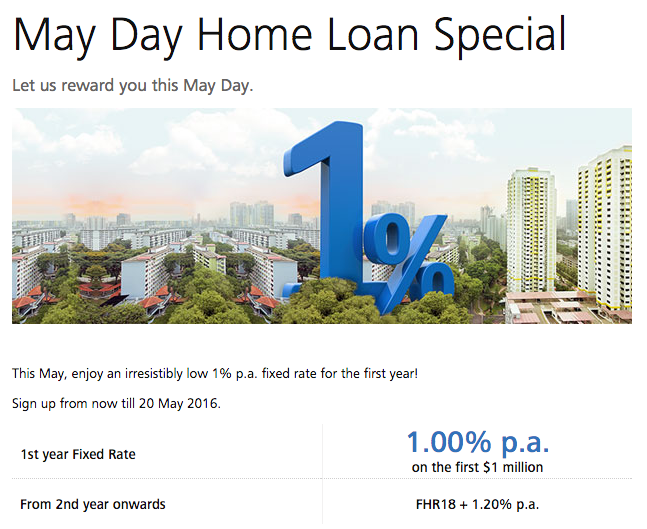 However, an ex-colleague just told me about a new home loan promotion by DBS called the May Day Home Loan Special (so gimmicky *rolls eyes*) which seems to offer the most attractive rates so far. For the uninitiated, please read my other article here about SIBOR and how it affects your home loans first. At 1% p.a., this is the cheapest rate currently offered among all the banks now. 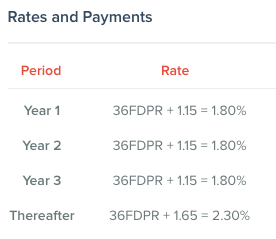 With the Fed expecting to raise interest rates this year, this fixed rate is fixed in the first year, which means I’m protected from interest rate volatility. Since we’re in a rising rates environment, this largely means that I can expect to pay less on this model compared to the other options out there. However, this 1% rate expires after the first year. Thereafter, DBS will charge interest based on the FHR18 + 1.2% p.a. Never heard of the FHR18? Well, neither did I until late last year. 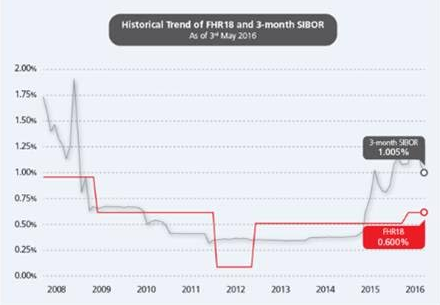 Essentially, the FHR18 was pioneered by DBS and refers to the rate pegged to DBS’ 18-month fixed deposit rate. This is currently 0.600% per year, significantly lower than the current SIBOR of over 1%. Thus, this DBS promo of 1% for the first year, and 1.8% for the second year onwards (current FHR18 is 0.600%), looks very attractive indeed. The other home loans, on the other hand, charge interest based on the SIBOR PLUS the bank spread, which are mostly 0.8% to 1.25% for now. 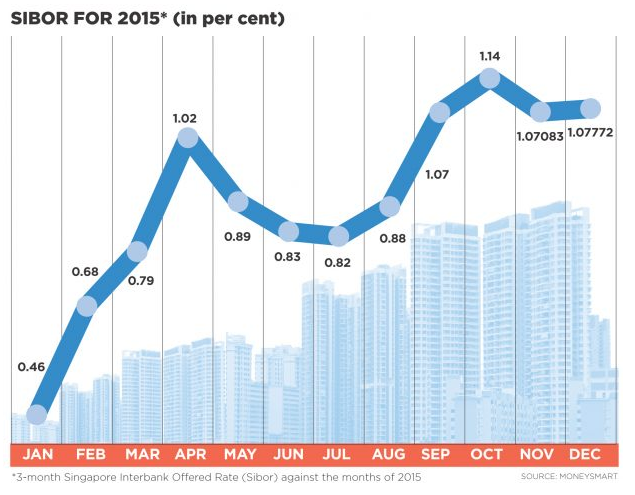 Assuming the SIBOR rises to 1.25% next year, that means you can easily expect to pay 2.05% to 2.5%. The SIBOR has been on a continuous uptrend over the past year, and with the Fed looking to raise interest rates, the SIBOR is very likely to continue going up. This is bad news, as a rising SIBOR rate will lead to higher interest payments for us consumers. No thanks. You got to applaud DBS for being innovative and being the first bank to launch home loan rates pegged to first deposit rates. The FHR18 is also transparent and a stable alternative to the 3-month SIBOR. It makes you wonder why no other bank thought of this idea before. For comparison, OCBC and UOB now offers home loans pegged to their FD-rate as well, but at 36 months instead. OCBC and UOB’s rate now is 0.65% which is higher than DBS’ FHR18. How does this compare to the other major banks’ home loans? OCBC’s version of the FD-linked home loan packages. The current 36-month FD rate is 0.65% (higher than DBS’ FHR18), which has been unchanged since Nov 2011. The prevailing rate thus adds up to 1.88%, which is cumultatively higher than DBS’ rate over the next 3 years. Note: The highest OCBC’s 36-month FD rate has been in the last 10 years was 0.925% in Nov 2005. 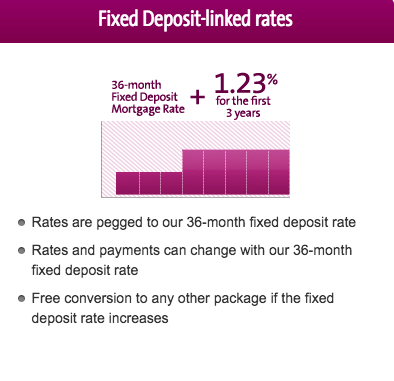 UOB’s rate at 1.8% on average over 3 years still works out to be lesser than DBS’ current promo thanks to the 1% fixed rate on the first year. Not bad at all, I’m definitely convinced. 1. There’s a lock-in period of 3 years, so you can’t refinance your home loans during this period to switch to a cheaper package. Fair enough, since most of the other banks’ home loans impose a 2 to 3 years commitment. But in consideration of the SIBOR’s rise, I doubt there’ll be a cheaper package anytime soon anyway. 2. It is also valid only for new loan applications, so if you already have an existing DBS home loan, you don't qualify for this discount. (Bummer! It makes sense though that they’re using this to entice customers of other banks to switch over.) But if you have a new loan application for your next property, you'll still be able to take advantage of this promotion. 3. If you’re looking to refinance, you’ll need to consider legal and cancellation fees as well. I called up DBS under the guise of being an OCBC customer with an existing home loan to ask how this would work, and while the they couldn’t advise me on how much these might add up to (due to lawyers charging different fees according to type of property and transaction), they offered me a minimum $1,500 cash rebate to help offset the costs if my loan amount is above $500,000. 4. The promo is only valid for the first $1 million loan. So if you’re taking out a large loan to purchase a luxury house, you can only take the first 1 million at 1% fixed rate, and go for other home loan packages for the remaining sum instead. 5. Now, there’s also a risk that since the FHR18 is a internally-determined rate, DBS could possibly raise the rate anytime at their whim and fancy. However, I feel that this is highly unlikely because it would result in a double-edged effect. Higher fixed deposit rates will also incur higher costs for DBS themselves i.e. while they might earn more on your home loan instalments, it also means they’ll also have to pay out more to consumers on our fixed deposits. 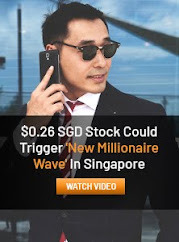 This DBS promo really is quite an attractive offer. 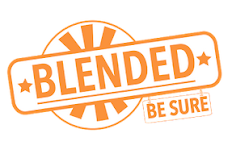 I asked some of my real estate agent friends, who have also told me about how their customers have recently switched over as well. What I like is that the FHR18 is lower than the SIBOR rate and is much easier to calculate and understand. With Fed and SIBOR interest rates set to rise, this potentially reassures us of lower interest rates on our home loan repayments, which is another big bonus. Just a pity I wouldn’t be able to sign on before the deadline since we haven’t yet picked a house yet, but oh well! I would think this package is risky as there is a lock in of 3 years. For the next 2 years if interest rates increase we won't be able to do anything at all. Considering most mortgages are now pegged to the SIBOR which will most probably rise given our inflationary environment (the Fed just said they'll be announcing the next rate hike soon too! ), the other loans will rise in accordance too. I still think this DBS promo is more attractive. Yes, it locks in for 3 years, but the first year is a fixed 1% which is the lowest. Let me know if you hear of anything cheaper, I'll be interested to find out cos I've not been able to find! Standard chartered just came out with a fixed deposit mortgage package too at 1.65% throughout. Its valid till end June. Not sure if you are in time for it? Hi,, I'm looking to purchase an uncompleted condo. So the abov DBS doesn't apply to me. What do you think is the best home loan for U/C private properties that I can look at? Thanks! The economy is not doing well (retrenchments across industries, growth forecasts are muted), and typically in a downturn, interest rates are kept low to stimulate the economy. Any thoughts around that? I'm not the Fed so I don't worry too much whether interest rates will / will not rise. I mostly look at what could result as a possibility of a rise and see how it could potentially impact my investments. Judging from the recent Fed talks though, it sounds like an interest rate hike is possible in July. Thank you for sharing such great information. It was very informative and has help me in finding out more detail about Property Loan! I need Personal Loans in Dubai. 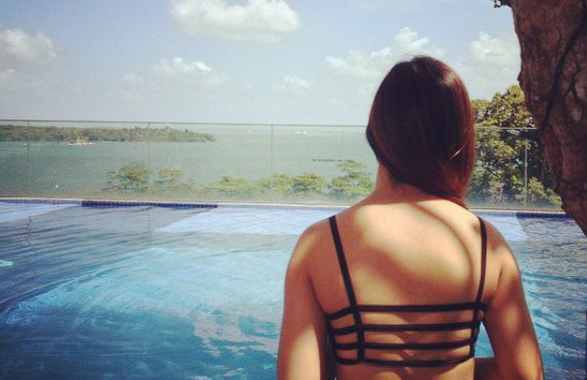 Can you give me your services in Dubai ....? Our loans are well insured for maximum security is our priority, you lose sleep at night worrying how to get a legit loan lender? You bite your nails to the quick? Instead of beating yourself, contact Paul Anderson credit agency today (Loan Services) Now, Loan specialists who help stop Bad Credit History, to discover the winning solution that is our mission. I love to read this blog cause it is informative and full of useful stuff. I appreciate church loan because it is easy to carry with everyday cost. Best Home Loan at attractive interest rates from HDFC Home loans. Bset Home Loan rates for women and salaried individuals.Home loans at lower processing fees. Use the interactive home emi calculator to calculate your loan for home. Get all details on interest payable and tenure using the housing loan calculator. Home loans at attractive interest rates from HDFC Home loans. Best home loan rates for women and salaried individuals. Avail home loans at low processing fees.